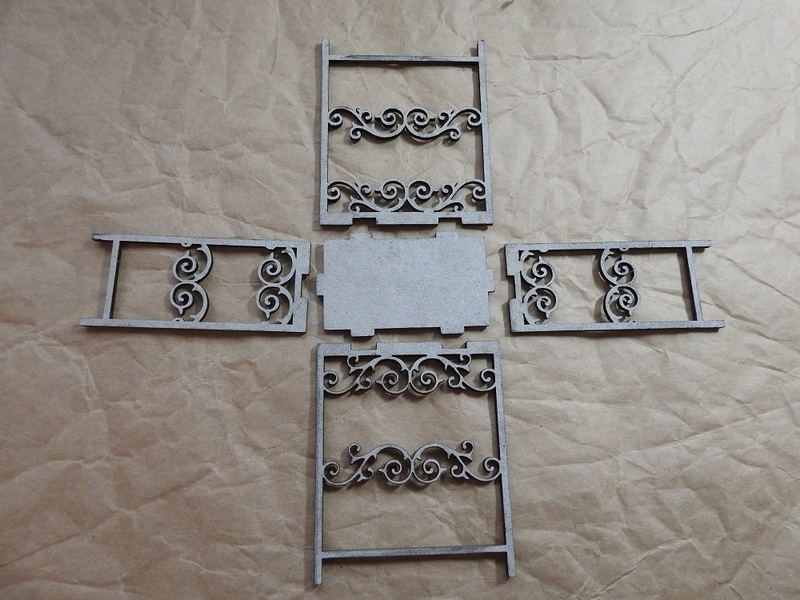 This one is so simple to put together, just 5 pieces! I decided the stand should be white to enhance the snowy scene so gave each piece a few coats of white acrylic paint on both sides then assembled the piece using tacky glue. 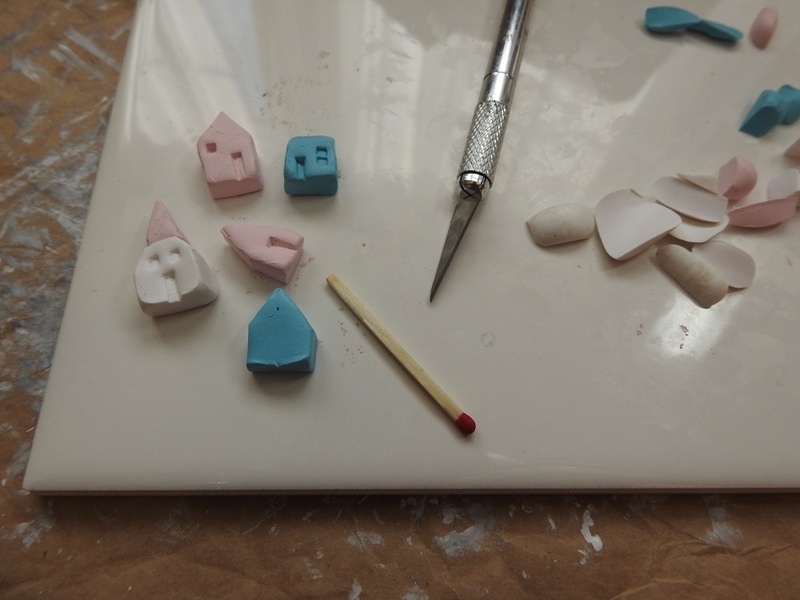 Using an X-Acto knife I cut tiny house shapes from polymer clay and used a square match to indent windows and doors before baking them off. 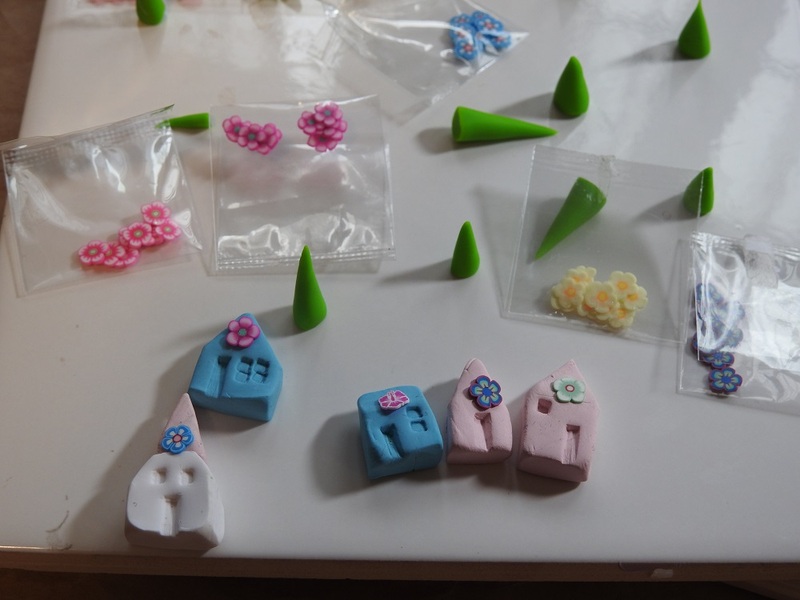 I also rolled out some cone tree shapes and dug out my stash of nail art supplies, aka polymer cane flower slices, to give the houses a bit of decoration. You can find these in nail supply stores and on Amazon. 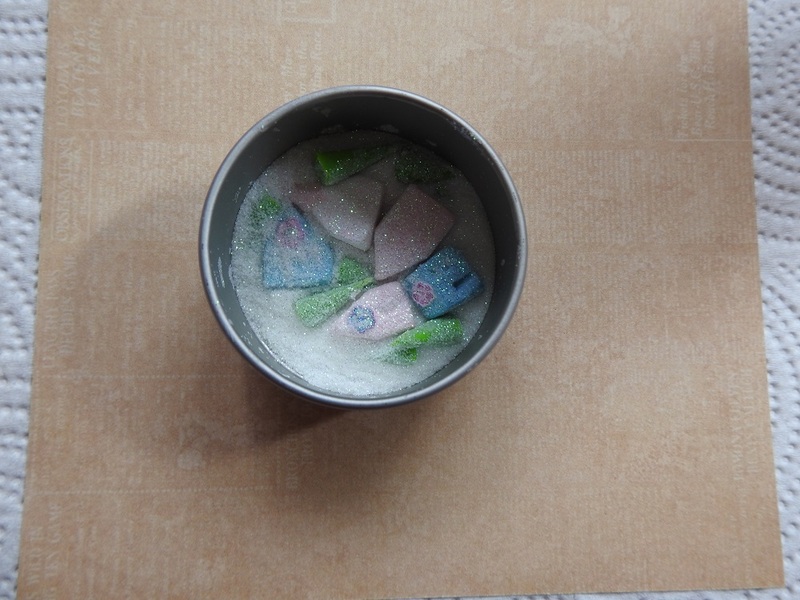 After baking, I applied a thin coat of tacky glue on each piece then tossed them into a container of superfine glitter to get them nice and sparkly. 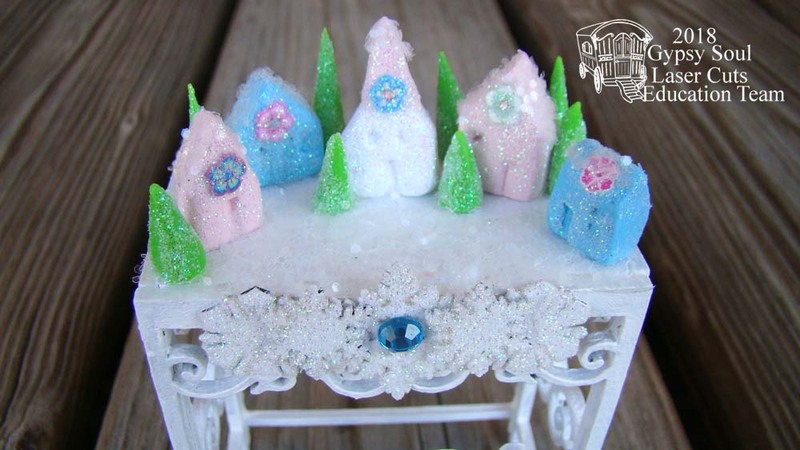 When the glue was dry, I added a bit of chunkier crystal glitter onto the rooftops for some sparkly snow. 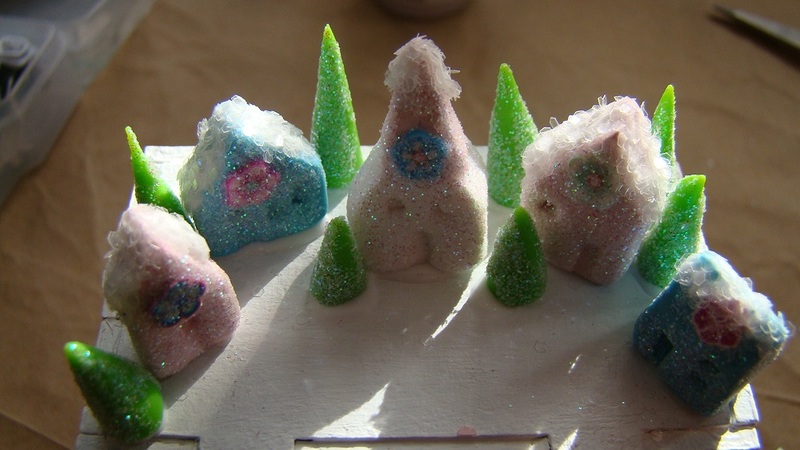 They were then glued onto the top of my assembled table to form a tiny village. I wanted to make sure not to get glitter on the sides of the table so I used painter’s tape as a barrier before coating the village floor with a thick coating of tacky glue. Then came the fun part…. dumping a LOT of crystal glitter to make a thick blanket of snow! 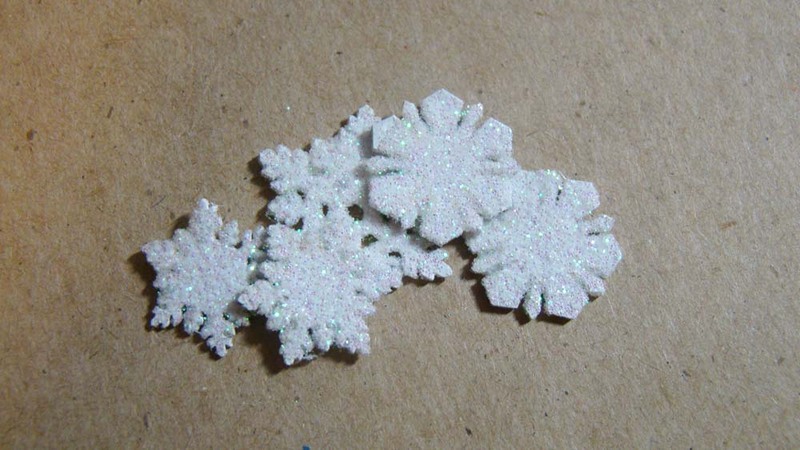 To finish the look, I used some of the GSL Snowflake Shape Set Minis as a decoration. I got white acrylic paint into the little crevasses using a soft bristled brush. When the paint was dry, I applied a thin coat of white glue and tossed them into the same superfine glitter to give them some sparkle. 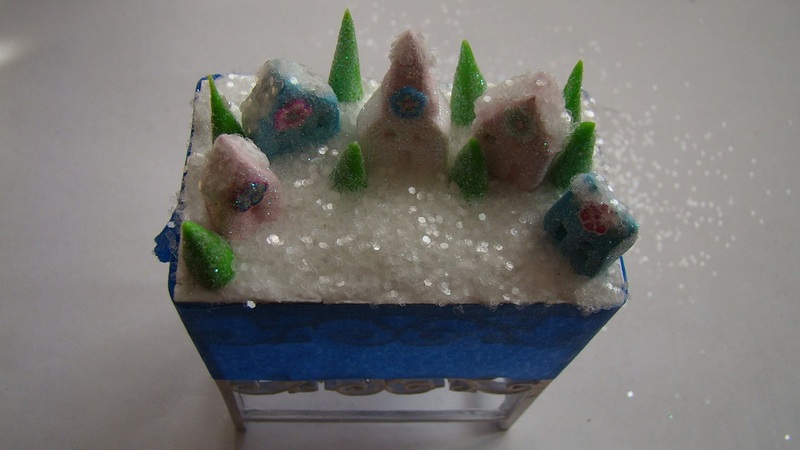 I glued them onto the front of the winter scene and finished it off with a bit of blue bling. 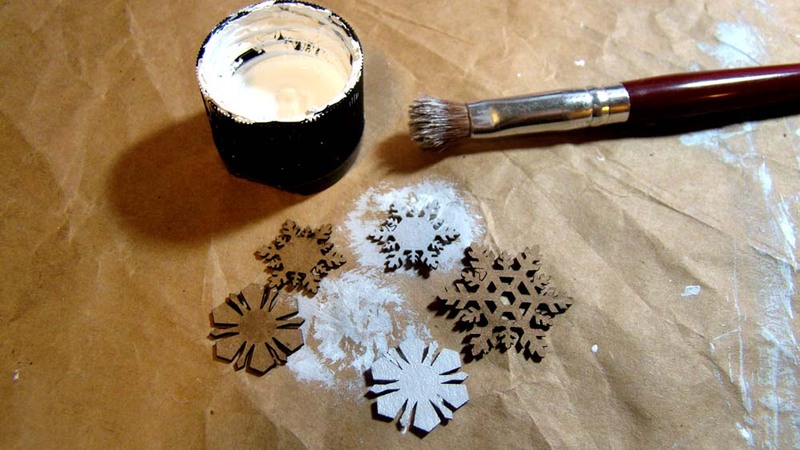 Once it’s fully dry, tap off the excess glitter and enjoy your winter wonderland! For my first project, I was inspired to make a home for a pretty little religious statue I recently picked up on vacation in Valetta using the GSL House Shrine Box. It’s a really great size to show off lots of treasures and this one fits perfectly inside. 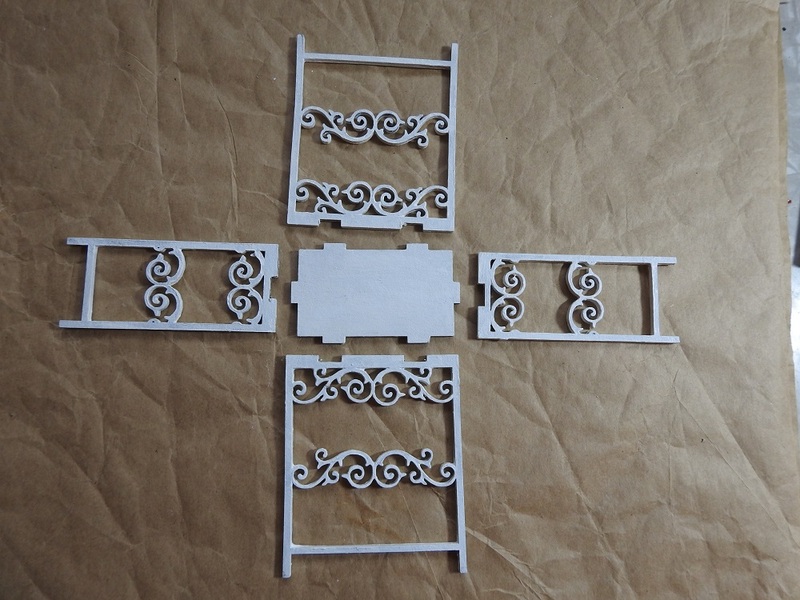 The first thing I do when I start a project is lay out all the pieces. This house shrine box is super easy to assemble and straightforward as to where the pieces fit together. Before I glue anything in place, I cut my scrapbook paper. I use the front and back pieces as a template, which makes it easy to lay out exactly which parts of the paper I want to use. Here’s everything cut out and ready to glue down. I start by gluing the interior rear and side wall papers in place using a tacky white glue. I then glue the back, front, floor and side walls together. I use rubber bands to hold everything in place while the glue dries. The base of my figurine is a little bit too wide to fit inside the shrine so I glue a domino for her to sit on. It’s the perfect height for her base. Around the domino, I glue a grassy green felt scrap into place to serve as the shrine’s flooring. Shingles and roof come next. I used GSL Chipboard Shingles- Pointed to jazz up the roof. I painted the shingle strips with brown acrylic paint then give them a thin wash of quinacridone azo gold paint. I painted the roof brown before gluing the shingles in place just in case any tiny section of it peeked through after I glued them in place. Next I cut the shingles into 1 3/4 inch strips, which I then glued in place. This project required four of the shingle strips in all. Once I glued my scrapbook paper on the outside shrine walls I was ready to get into my crafting flowers and embellish away.